The field of solid state NMR of biological samples [ssNMR] has blossomed in the past 5-10 years, and a cohesive overview of the technology is needed for new practitioners in industry and academia. This title provides an overview of Solid State NMR methods for studying structure dynamics and ligand-binding in biopolymers, and offers an overview of RF pulse sequences for various applications, including not only a systematic catalog but also a discussion of theoretical tools for analysis of pulse sequences. Practical examples of biochemical applications are included, along with a detailed discussion of the many aspects of sample preparation and handling that make spectroscopy on solid proteins successful. 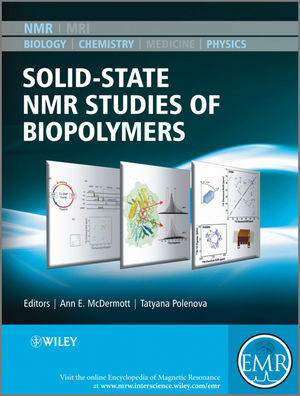 Anne E. McDermott and Tatyana Polenova are the authors of Solid State NMR Studies of Biopolymers, published by Wiley. Part A: Fundamentals of Solid-State NMR Spectroscopy. 1 Internal Spin Interactions and Rotations in Solids (Michael Mehring). 2 Average Hamiltonian Theory (John S. Waugh). 3 Tensors inNMR (S. Chandra Shekar, Alexej Jerschow). 4 Chemical Shift Tensors (David M. Grant). 5 Magic Angle Spinning (E. Raymond Andrew). 6 Cross Polarization in Solids (Douglas P. Burum). 7 Quadrupolar Nuclei in Solids (Alexander J. Vega). Part B: Recent Developments in Solid-State NMR Hardware and Emerging Methodologies for Structural and Dynamics Studies of Biopolymers. 8 Probe Development for Biosolids NMR Spectroscopy (Peter L. Gor’kov, William W. Brey, Joanna R. Long). 9 High-Frequency Dynamic Nuclear Polarization (Melody L. Mak-Jurkauskas, Robert G. Griffin). 10 Homonuclear Dipolar Recoupling in Solid-State NMR (Robert Tycko). 11 Dipolar Recoupling: Heteronuclear (Christopher P. Jaroniec). 12 Adiabatic Polarization-Transfer Methods in MAS Spectroscopy (Matthias Ernst, Beat H. Meier). 13 Symmetry-Based Pulse Sequences in Magic-Angle Spinning Solid-State NMR (Malcolm H. Levitt). 14 Dipolar-Based Torsion Angle Measurements for Protein Structure Determination (Vladimir Ladizhansky). 15 Deuterated Peptides and Proteins: Structure and Dynamics Studies by MAS Solid-State NMR (Bernd Reif). 16 Correlation Spectroscopy for Resonance Assignments in Solid-State Proteins Using J-couplings (Leonard J. Mueller, Jeremy J. Titman). 17 Indirect Coupling and Connectivity (Anne Lesage). 18 Fast Magic-Angle Spinning for Protein Solid-State NMR Spectroscopy (Donghua H. Zhou). 19 Relaxation Studies of Solid Biopolymers (J´ozef R. Lewandowski, Lyndon Emsley). Part C: Computational Aspects of Solid-State NMR Spectroscopy. 20 Proteins and Model Systems: Spectral Analyses (Eric Oldfield). 21 Numerical Simulations in Solid-State NMR with SIMPSON (Thomas Vosegaard, Zdenˇek Toˇsner, Niels Chr. Nielsen). 22 Protein Structure Calculation Using Ambiguous Restraints (Michael Nilges, Th´er`ese Malliavin, Benjamin Bardiaux). 23 Protein Structure Calculation and Automated NOE Restraints (Torsten Herrmann). Part D: Applications of Solid-State NMR to Structural and Dynamics Studies of Biopolymers. 24 Aligned Membrane Proteins: Structural Studies (Riqiang Fu, William W. Brey, Timothy A. Cross). 25 Membrane-Associated Systems: Structural Studies by MAS NMR (Christian Ader, Marc Baldus, Stefan Becker). 26 Structural Studies of Protein Fibrils and Misfolded Proteins by Solid-State NMR (Beat H. Meier). 27 Structural and Dynamics Studies of Lipids by Solid-State NMR (Michele Auger). 28 REDOR Applications in Biology: An Overview (Orsolya Toke, Lynette Cegelski). 29 Quadrupolar Metal Nuclides in Bioinorganic Chemistry: Solid-State NMR Studies (Andrew S. Lipton, Tatyana Polenova, Paul D. Ellis). 30 Photosynthetic Antennae and Reaction Centers (Huub J. M. de Groot). 31 Structure and Function Studies of Energy and Signal Transducing Proteins by Solid-State NMR (Hideo Akutsu, Toshimichi Fujiwara). 32 Protein–Solvent Interactions in Solids (Anja B¨ockmann). 33 Unifying Solution and Solid-State NMR Studies of Nucleic Acid Dynamics (Kari Pederson, Dorothy C. Echodu, Prashant Emani, Greg L. Olsen, Michael F. Bardaro Jr., Zahra Shajani, Gary A. Meints, Paul A. Miller, Gabriele Varani, Gary P. Drobny).